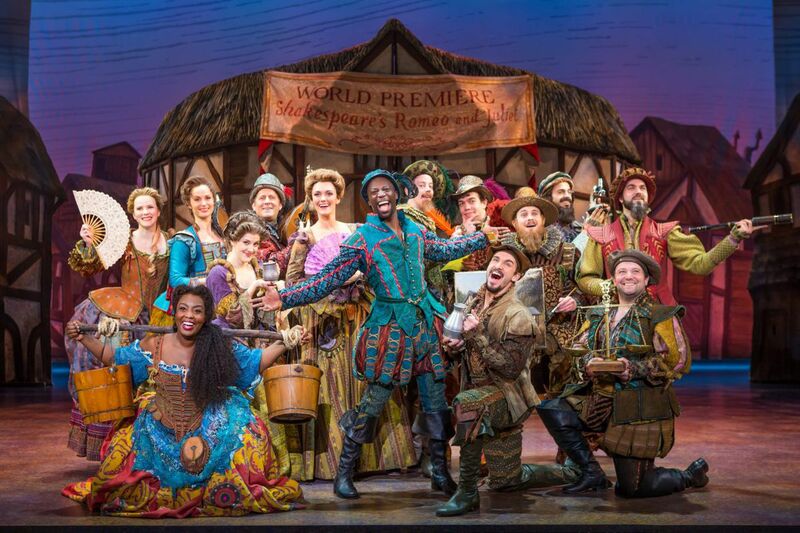 The cast of the national touring production of “Something Rotten,” Feb. 24-March 4 at the Academy of Music. With all the Broadway pizzazz anyone could want, the hilarious Something Rotten! has arrived at the Academy of Music (through March 4) with codpieces blazing and couplets rhyming. Nominated for 10 Tony Awards in 2015, this goofy, clever show provides, unlike some touring productions, a spectacularly talented cast. Casey Nicholaw directs; he also choreographed the big production numbers that are sensationally danced by a big-voiced chorus of high-kickers. The witty book is by Karey Kirkpatrick and John O'Farrell, and the rambunctious music and lyrics are by Wayne Kirkpatrick and Karey Kirkpatrick. Then you gotta create a musical. The allusions fly by — catch them if you can — from Annie to South Pacific to Fiddler on the Roof to My Fair Lady, with plenty of Fosse jazz hands. Tap-dancing is discovered. Why do it? "Because it's entertaining." It sure is. And just as Nostradamus predicted, the crowd — the one sitting in the Academy of Music — goes wild. The Puritans show up, trying to spoil the fun and the romance. Adorable Portia (Autumn Hurlbert) falls for Nigel (their duet, "I Love the Way," is lovely), while Nick's supportive wife (Maggie Lakis) keeps the faith, singing, "I'm more than just a woman / I'm your right-hand man." More allusions fly by, from Hamlet to The Merchant of Venice to Romeo and Juliet, requiring more catching as catch can. Tiny details provide more humor: when Pascal as Shakespeare belts out "Hard to be the Bard," on his desk are not only a quill but also a Shakespeare bobble-head. The Bard sends invitations to a big bash. Where? In the park. "What a party!" the Queen says. "I could have danced all night."